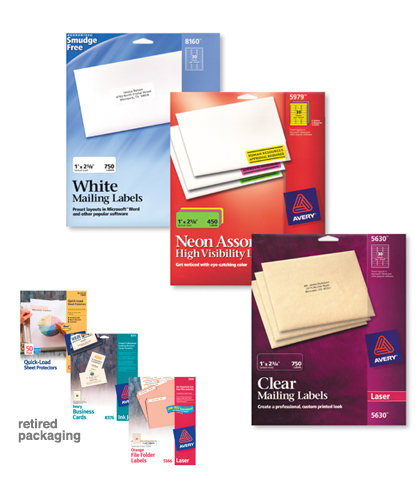 Though primarily a business-to-business manufacturer of adhesives and base materials for industrial and commercial applications, Avery Dennison is perhaps best known for its consumer-oriented Avery office products. Over 1,000 Avery SKUs include a wide variety of laser and ink-jet self-adhesive labels and card products, graphics software, binders, dividers, sheet protectors and marking pens such as Hi-Liter® and Marks-A-Lot®. For many years, Avery’s business mix had been 90 percent commercial, 10 percent consumer. The proliferation of national office superstores has made the purchase of office supplies a neighborhood retail experience. Moreover, a growing small office/home office work force and the impact of the personal computer on family life generally had caused Avery to question the ability of its product packaging to appeal to these many new consumers. Its packaging system had a conservative business look which research revealed did not appeal to these emerging niche markets. Analysis revealed the need for the better use of color and product copy as information cues to shoppers navigating among categories containing hundreds of products. The refreshed packaging system has been shown to increase shelf presence of Avery products, impede encroachment by the competition, and better support a premium pricing position.